Using the Admin Portal to manage your Prospect 365 Users. To manage the users of your system you need to be logged into the My Prospect 365 Portal. The Manage User section can accessed from https://admin.prospect365.com/Users. To create a new user simply select ‘Add User’ from the right hand side. This will then allow you to enter information specific to that user. Please make sure that the information is entered correctly, especially the email address, as this will be used to send the invite to them for the CRM. The email will inform the new user that they have been invited to join the specific customer profile. Once the user has been created and invited you are able to set certain permissions from the options detailed below. This section allows you to set the required license for the user in question, as well as what parts of the CRM and CMS they can administer. A paid license where the user will have access to all of the options selected under the Roles section. Once this has been selected for the user, it will be added to the monthly invoice of the system. This is used for an individual who needs to access the customer portal to view dashboard information, but not use the full functionality of the system. A user who has left the organisation or no longer required access to the system. Allows the user to create Sites and publish changes. Allows the user to publish changes which have been made on Sites, it is also possible to determine which Sites this user has access to. Allows the user access to the CMS to manage Sites, & it is also possible to determine which Sites this user has access to. Allows the user the ability to set up new users and roles. Ticking this box will set the user as an Account Manager and will then be included in any Account Manager drop down within the system. If the individual is going to be using the Email Marketing integration with the CRM, they will need to have this section ticked. Within the CRM you can group users into particular dictionaries. This can then be used to allow only certain users to view particular pieces of information. Similar to the above, User Groups can help to split and organise the users of the system. This can be used for reporting purposes to see information only from certain groups of users. Allows the user to update and alter admin tables within the CRM as well as being able to delete records. Allows the user to make bulk updates to the records shown in a report. 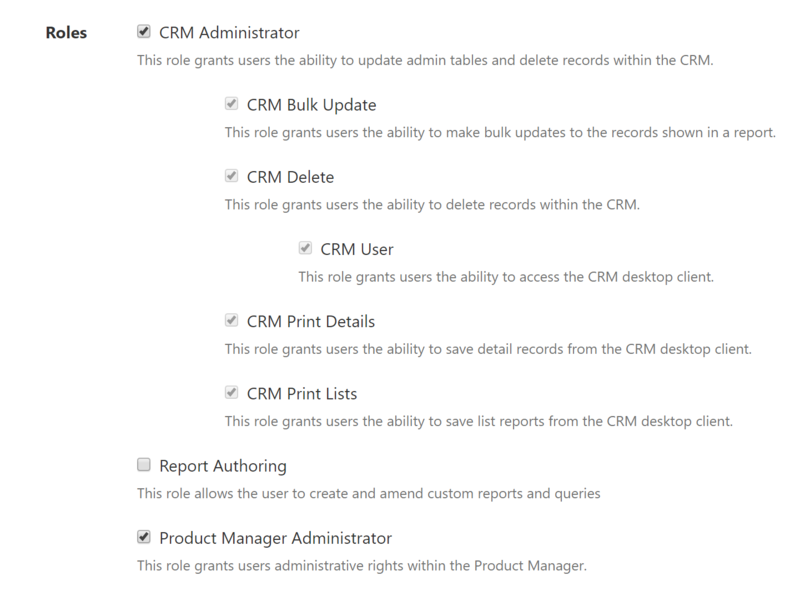 Allows the user the ability to delete records in the CRM. This must be selected for the user to have access to the CRM system. This option will allow the user to print the details of records from the CRM. This is information held about a certain record such as Name, Address, Phone number etc. If this option is selected then the user can print any information which is returned from the CRM as either a search or a report. This must be selected if the user in question is going to be creating custom Reports for the CRM. Allows the user to have administrator rights within the Product Manager. If a user has forgotten their password to access the CRM and customer portal, they will need to have a new one issued to them. 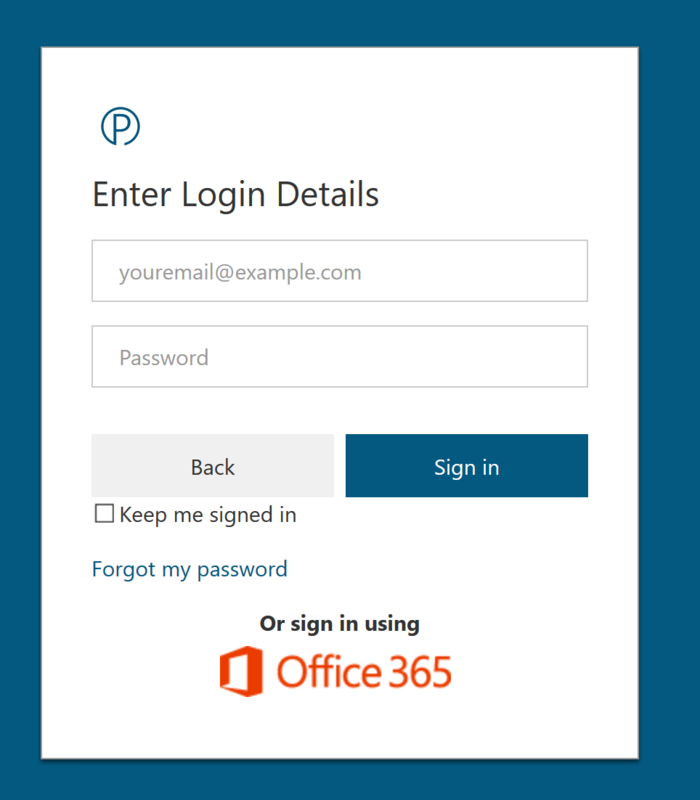 This is done from the main login page – https://login.prospect365.com. Selecting ‘Forgot my password’ will take you to a new window where you will be asked to enter your email address. This must be the email address which was entered originally and that the initial invitation email was sent to.